Today we come to The Silver Chair, book 6 in the series and a continued account of Eustace Scrubb’s adventures in Narnia. He became a begrudging extra on Edmund and Lucy’s last adventure in The Voyage of the Dawn Treader, but by the end of that story, he’d changed quite a bit for the better. Now that his cousins have outgrown Narnia, Eustace carries on with the work for humans there. 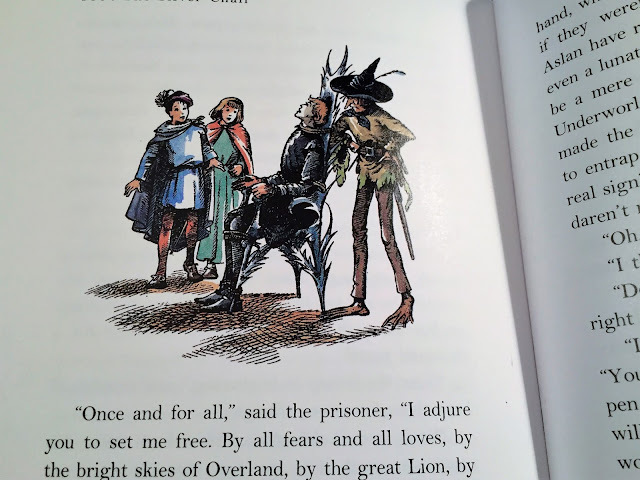 It begins one ordinary day during recess – Eustace and his friend Jill Pole stumble into Narnia, and they’re tasked with rescuing Prince Rilian, the lost son of King Caspian the Tenth, who the Pevensies helped to enthrone. By Narnian time, it’s been decades since Eustace’s adventure on the Dawn Treader, so Caspian is now an elderly man. And a mysterious evil Witch, often disguised as a green serpent, is responsible for the death of Caspian’s queen and the disappearance of Prince Rilian. Aslan charges Jill with several “signs” that will guide them on their journey, and they soon set out with their assigned companion, an odd creature called a marsh-wiggle whose name is Puddleglum. Aslan: As usual. But in this book, he’s one of the few who are consistently likable, and his role reminds me so much of the patient forgiveness of God. Mainly because Jill and Eustace drive me nuts much of the time, I greatly admire his persevering love. As you may expect when they start out on the journey, Jill promptly forgets all the signs Aslan has given her, and throughout, Jill and Eustace’s bickering and stubbornness cost them time and a few close safety calls. But Aslan never condemns and never gives up on them. How thankful I am for this attribute of our Lord! Puddleglum: Who doesn’t love this guy? I’d argue that he’s the most unique and creative character in any of the Narnia books, and despite his Debby-downer outlook, he frequently is the only sane one of the traveling trio. He’s smart and resourceful even if he’s pessimistic, and he often is the one who gets them all out of bad scrapes. Plus, his gloominess can take a humorous turn, giving an excellent comic relief effect. First of all, this whole sequence in the giants’ territory is fun to read. The descriptions of the large sizes of everything are a treat for the imagination and pretty funny. But of course, when the children and Puddleglum realize they need to escape, the suspense and excitement amp up. What’s more, it bonds the three of them in a way they hadn’t been up until this point. And I really admire their sneakiness as they fool the giants and figure out a getaway plan. The ensuing chase makes it that much more thrilling! Exactly. God doesn’t usually tell us what will happen. He only tells us what to do and asks us to trust Him with what’s next. Such a needed reminder! And then Aslan commands Eustace to drive a thorn into his paw. I know I’d be upset at this request too, Eustace! But when the blood splashes onto Caspian, he becomes a young man again – the same vibrant king Eustace knew on the Dawn Treader. That’s when they realize they’re seeing a new and resurrected Caspian in his life after death. From the blood of a perfect King comes life – I love it! And of course, the return to England and the ensuing fight with Jill’s bullying schoolmates is the icing on the cake. I’m glad Caspian got his wish to see their world, and it’s satisfying to see that things improve at home for Jill and Eustace too. There are no accidents. Our guide is Aslan; and he was there when the giant King caused the letters to be cut, and he knew already all things that would come of them; including this. Even in this world of course it is the stupidest children who are most childish and the stupidest grown-ups who are most grown-up. “You cannot want wrong things any more, now that you have died, my son,” said Aslan. What are your favorite moments of The Silver Chair? How does this one rank in comparison to the other books in the series for you? I'd love to hear!